Media: Soft, glossy, laminated colour covers; 21.5cm x 28cm portrait format, 144 good quality satin-finish pages. Advantages: The technical and historical detail. Rare and unpublished photographs. 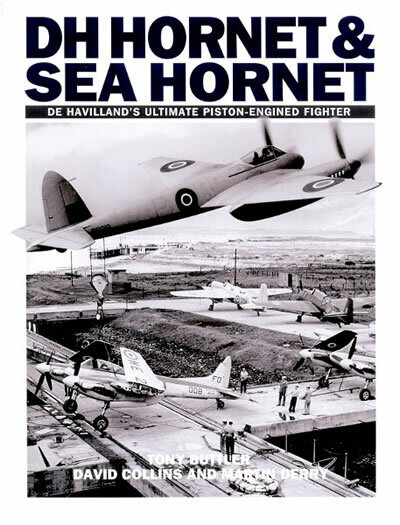 Conclusion: Good examination of De Havilland's superb Hornet and Sea Hornet. Significant amount of technical detail of use to the modeller and scratch-builder. Recommended to anyone with an interest in British naval aviation and aviation history. Another year, and yet another Fleet Air Arm aircraft volume; we really must have done something right somewhere, to be so blessed. In fact published back in mid-2010, this belated review of 'DH Hornet & Sea Hornet' by Dalrymple & Verdun, comes at a time when the United Kingdom's aircraft carrier capability is in flux. As I write, 'Invincible' class carrier HMS Ark Royal, welcomes her last public visitors, as the ship's company parade through Portsmouth for the last time. Her Harriers are gone, ignominiously to be scrapped, and whilst the ultimate fate of the 'Ark' is still to be decided, a gulf of several years awaits her replacement in the form of the the new HMS Queen Elizabeth (a ship for which, there are currently no fighter aircraft available). So what has all this got to do with the subject of this book review, I hear you ask? Well not much really, its just that I felt like 'venting' at an important moment in Royal Naval history. Seriously though, both the Hornet and Sea Hornet also came at a time of flux in UK military affairs. Both were the ultimate expression of piston-engined design, at a time when jet aircraft were becoming a reality and from a carrier point of view, the Sea Hornet's potential 'finest hour' was instead taken by the Sea Fury, as it was the latter which battled it out in the skies over the Korea. Lack of suitable carrier capability, left the Sea Hornet on the sidelines. As they say, 'the rest is history'. Meanwhile, back at the book review! At 144 pages, this is one of D&V's larger titles and the cover price reflects this, so what do you get for your money? Well first, you get a principal author in the form of Tony Buttler, so we should have no worries in that department. On this occasion, he is ably assisted by both David Collins (helping with photographs, illustrations, anecdotes and technical terms) and fellow author Martin Derry (who handled the editing). Throw in numerous other individual collaborators, some well-known, some not so well-known, as well as input from the RAF Museum at Hendon, the National Archives at Kew and the Fleet Air Arm Museum, and I think we can be fairly confident about the overall content and its accuracy. Moving on to the contents. 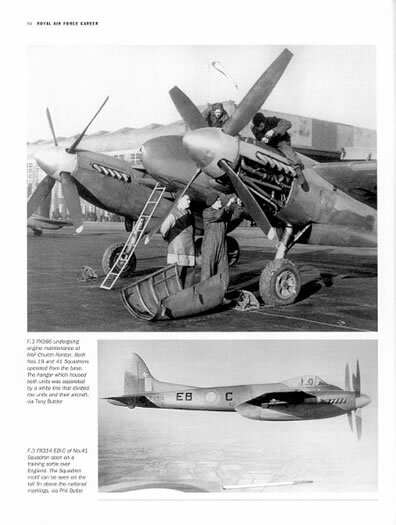 After the author's short introduction, which also links this work to his earlier D&V book on the Sea Fury, chapter one inevitably charts the origins and need for the Hornet, born of its predecessor, the Mosquito. 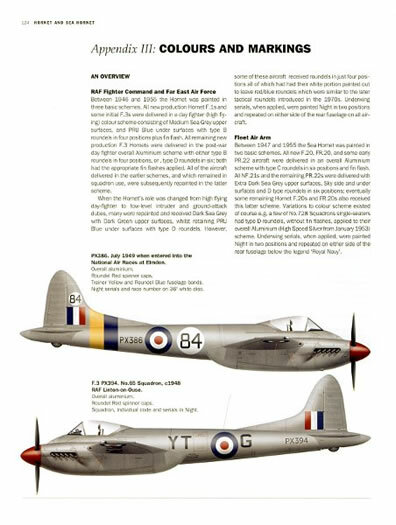 Variants and flight testing are covered in chapter two, including some interesting comparisons with contemporary fighters (Meteor, Spitfire and Mustang), as well as charting the development of the naval version from the land-based prototype. 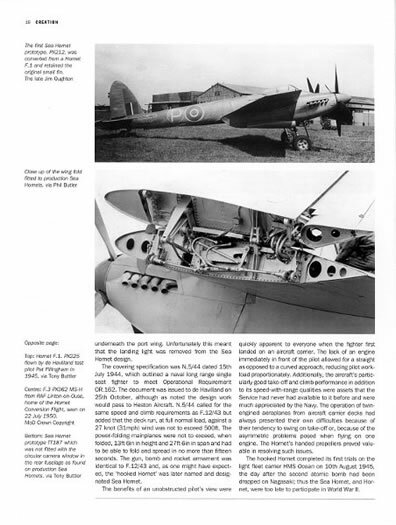 There is also a short piece on the proposed 'Highball' Hornet, a variant designed to drop two 'bouncing bombs' (against warships) in a similar way to the dam-busting exploits of the Second World War. Chapters three and four, look in detail at the Hornet/Sea Hornet's career with their respective services (RAF and FAA). In each case, Squadrons and Units are identified and their respective duties described, and naturally in the case of the Sea Hornet, this encompasses ship-board deployments as well as shore-based activities. These and the preceding chapters, are full of technical detail and copiously illustrated with many excellent, mostly black and white, photographs. There are one or two poorer-quality images included, but these can be excused, either by their scarcity or by their subject. In total, I estimate that there are getting on for 220 photographs in all, the majority in black and white, but they do include one or two in colour. Personal recollections of pilots, engineers and maintainers, are a feature of D&V's larger titles and these are covered in chapter five. Many submissions are from RAF pilots and ground crew, but there are also testimonies from a development and testing veteran and one from a FAA pilot. All contribute to forming a picture of a well-regarded aircraft and serve to further illustrate the extensive nature of the UK's military operations, some sixty years ago. The final chapter 'proper', is chapter six. This consists of a technical description of the aircraft and its construction, under such sub-headings as; 'Fuselage', 'Undercarriage', 'Powerplant' and 'Cockpit'. To round off the book, there are no less than five appendices, followed by some miscellaneous photographs and an 'Abbreviations and Bibliography' page. The first four are relatively self-explanatory; 'Technical Data', 'Squadrons and Units', 'Colours and Markings' and 'Production Details'. Through David Collins' work, the book claims that it now accurately enumerates the Hornet's dimensions, correcting a number of errors which have been perpetuated in earlier publications. There are a good selection of variants in Mark Gauntlet's colour artwork profiles, but (excluding the prototype) there are only two FAA examples and one of those (an F.20) is in aluminium finish for 'Winterisation' trials in Canada. Appendix five ('The Hornet Project'), looks at the project started by David Collins in 1999, to recreate a Hornet cockpit as a means of fund-raising and reuniting former air and ground crew. Using other Hornet parts and original construction techniques, the project hopes to create a complete fuselage with fin and rudder, for display in a museum. Amazingly, despite all the Hornets which were produced, some of which never even flew, no complete Hornet survives today. In my opinion, this is a pretty good examination of De Havilland's superb Hornet and its naval equivalent, the Sea Hornet. There is a significant amount of technical detail here, much of which will be of use to the modeller tackling the few kits that are available. Some of this will be especially useful to the scratch-builder, such as photographs of the cockpit, of the Sea Hornet NF.21's nose radar (with the nose and internal covers removed) and also of the Sea Hornet's wing-fold details. From my own perspective, the lack of wing-fold is an aspect of the Classic Airframes kit I built, which I feel I could now address using this information. Whether I'd have the courage to take a razor-saw to the wings of my finished model, is another matter however! 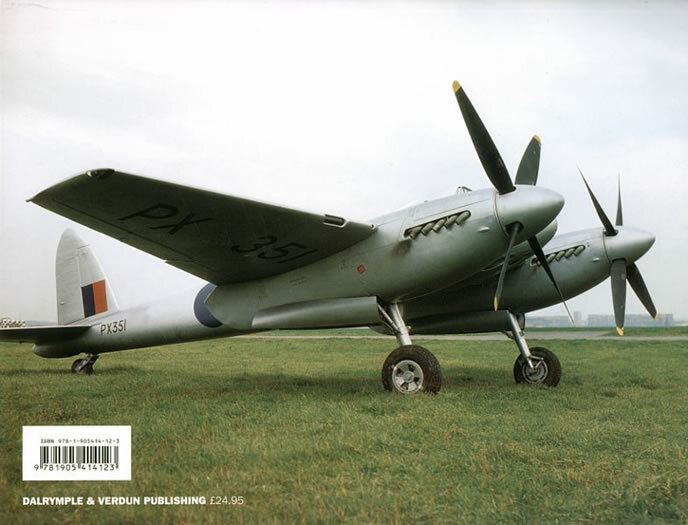 One other interesting material fact relating to the Sea Hornet that I gleaned from this book, is that they did not, in fact, have the landing light under the Port wing, as fitted to the RAF version. This is because it interfered with the installation of the wing-fold mechanism and means that this is an 'error' on my model (and presumably on those of other modellers), which ought to be corrected - to slightly mis-quote Michael Cane, 'Not a lot of people knew that'. So to sum up then; great technical content, excellent photographs and illustrations, described in an engaging and informative way. No prizes for guessing therefore, that I recommend this book to anyone with an interest in British naval aviation and in aviation history generally.